I made quite a bit of progress on my sock over the weekend, which kind of surprised me. But it didn't happen. The toe is done. The heel is shaped. The cuff will soon begin. I don’t want to jinx it, but I think might actually complete an entire pair of socks this time. Up until this point I have only knit one ugly orange cotton sock and a half of a pretty bamboo one. 1. I’m using wool yarn. So much easier to work with than cotton or bamboo. 2. 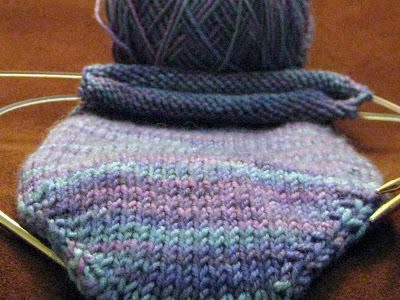 The yarn is soft, pretty, and self-striping. Love those stripes. 3. It's the toe-up method rather than cuff-down. I prefer it, maybe because it's the first method I learned. 4. I’m not troubled by the little imperfections here and there. As my wise sock teacher once said, “This is your first pair of socks, not your last.” Or in my case, this is my third attempt, not my last. On a different subject, a big thank you to AllFreeKnitting and Totally Tutorials for featuring my pattern for a miniature knitting bag on their website. It's a great holiday project because it can be used as an ornament, to decorate a gift, or even turned in to a brooch. One clever knitter on Ravelry made a smaller version as a key chain. Look at you go! That is really beautiful yarn; no wonder you're inspired to finish those socks! Congrats on your pattern feature! What a cute little basket! Way to go on the sock! You are doing great! I can crochet (not real well) and have never dared try to knit! I don't think I have that kind of coordination! Hurray, for your sock, Stacy. Wool yarn is so very nice to work with. The self-stripping yarn is anything but boring. Always a change of color to keep things interesting. I do both toe-up and cuff down using the magic loop method. 2-at-a-time so when I'm finished, I'm finished. A knitting pal gave me a little knitting bag with two balls of yarn and knitting needles. So cute and what a surprize to receive it. I love your sock , the colours are amazing AND the minature knitting bag is divine!! How great that you can knit socks! Knitting socks is the reason I took up knitting. I have not been able to make a wearable pair yet, but I will keep trying. That is so cool that your pattern was featured and it's darling! Those socks will keep you warm! Rec'd your darling ATC today!!! Our's are similar...mine will go out later this week.. great minds think alike! That little bag is adorable -- how'd I miss that? (Ok, I probably didn't miss that, I just can't remember anything LOL!) And the sock! That yarn is gorgeous!!! You are too clever!!!! Love the looks of the sock and the colors are yummy! Congrats to you...from you instructor! Next, you will pass me by on Crazy Quilt stitches and win lots of awards! I am so so so proud of you my dear friend. See you real soon! 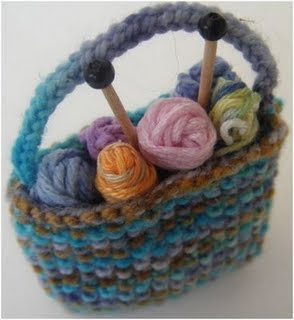 Love your little knitting bag! And, I too, love the toe up method of making crochet socks ( I don't knit all that well) I find with that method, you can correct mistakes as you go easier.